In 2009, Mindy Irish was 95 lbs. overweight after having her fourth baby. Today, she’s lost the weight and training for her first physique contest and blogging about her experiences at fitgalclub.com. There’s nothing like a milestone birthday to bring about positive change in one’s life. For Mindy Irish, the magic number was 35. 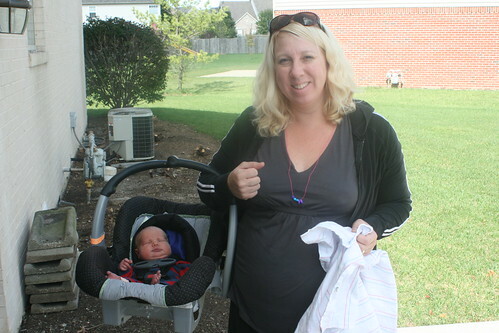 Two days earlier, she gave birth to her 4th child and was 95 pounds overweight. This pivotal event occurred in early October, 2009. “Reading about the ill health effects of excess weight, I could feel that change was in order,” said Mindy. Most importantly, she wanted to feel better about herself. Mindy’s past was littered with failed diet attempts. One diet program would start, she would lose some weight, then get pregnant again and be happy she could “eat” again. After the birth of their 4th baby, she vowed to avoid the yo-yo effect again. The solution was to make some lifestyle changes. Working with her husband in realty and remodeling, and being a mom, finding time to exercise is a challenge. Mindy Irish just weeks after her fourth child, 95 lbs. ago. Making small changes, Mindy started out by slowly adding exercise into her already busy daily routine. With four kids 6 and under, life is in constant motion, so she took that motion to the Fishers YMCA. Able to capitalize on the childcare available, Mindy was able to work out with weights on a regular basis and make time for cardio. With the support of her husband, Dan, Mindy was able to stay on task. “You make it a priority, like brushing your teeth – it’s a daily activity that isn’t skipped,” said Mindy. Over the next two years, Mindy was successful at losing the 95 pounds. Last year, the possibilities of where this weight lifting and exercise could take Mindy began to materialize. She was encouraged through a friend to attend a Physique competition. “I never pictured myself on stage in that skimpy bathing suit, but I realized it was a potential option.” Mindy decided that if she could keep the weight off successfully in a year’s time, she would compete. Common with most extreme weight loss patients, Mindy had some 7 pounds of extra skin surgically removed. Having successfully maintained her weight for over a year, she made the tough decision to proceed with the surgery. Coming off the surgery with 23 weeks until the competition, Mindy is focused on her goal. Determination, when directed in a healthy way, has served Mindy well. She credits her mind set. The weight loss has been the result. She owns it, takes full responsibility for her body, and that body has responded well. It’s a daily sacrifice, but it has been worthwhile. Positive habits have an energy all their own, and she is certainly channeling hers!